When we first moved to Asheville, we met Todd + Megan of Atomic Furnishings. We bonded over all things natural and mid century furniture. Growing up, I would go to garage sales and old school warehouses to search for mod pieces to refurbish for our home. I loved that each piece told a story. The fabrics were usually old and needed an updating. My Step Dad would take me to the Knoll fabric store and I fell in love with the colors, textures and possibilities! I think those memories have a big influence in my current career as a textile artist and home decor designer. I appreciate well curated moments within a home, small silhouettes that can change your mood. You can tell Todd + Megan are in the industry for searching for beautiful pieces because they love the stories as well. I really appreciate their hard work salvaging pieces while taking awesome product shots and creating a store that provides hours of inspiration! Atomic Furnishings is our only stockist in Asheville and we are proud to send customers their way! 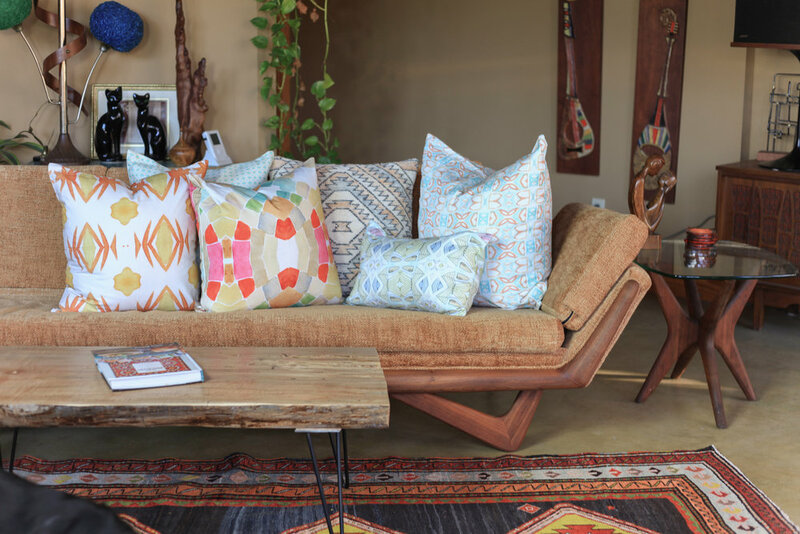 Take a peak into their showroom and mid century modern home – featuring bunglo pillows! African samba meets tropical mid century. D R E A M Y.